As more businesses and consumers turn to e-commerce, shoppers’ expectations for the ease and convenience of the online shopping experience rise. To meet customers’ evolving needs, merchants must invest in and innovate their returns solutions. 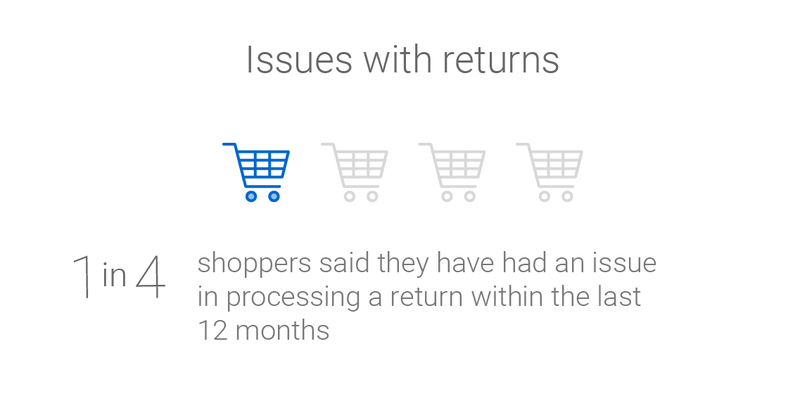 Returns are a major sticking point for customers. Most want returns to be easy and affordable, if not free. This growing expectation creates financial conundrums and logistical difficulties for merchants of all sizes. Even the top e-commerce merchants struggle to meet consumer expectations. For one-third of consumers, the ease of making a return is a critical factor in their decision to purchase. But less than half of the 200 top e-commerce merchants in Canada offer the returns experience that Canadian consumers demand. Nothing ruins a shopping experience quite like a return gone sideways. And the gap – between what consumers expect and what merchants offer – becomes widest at this point. Satisfying customers’ desires is always challenging because most businesses are measured against every positive experience a shopper has ever had. Figuring out ways to keep your customers happy, without losing money on returns, is a challenge – but one that is worthwhile to undertake. Merchants who turn a blind eye to what consumers expect in terms of returns will pay a high price. 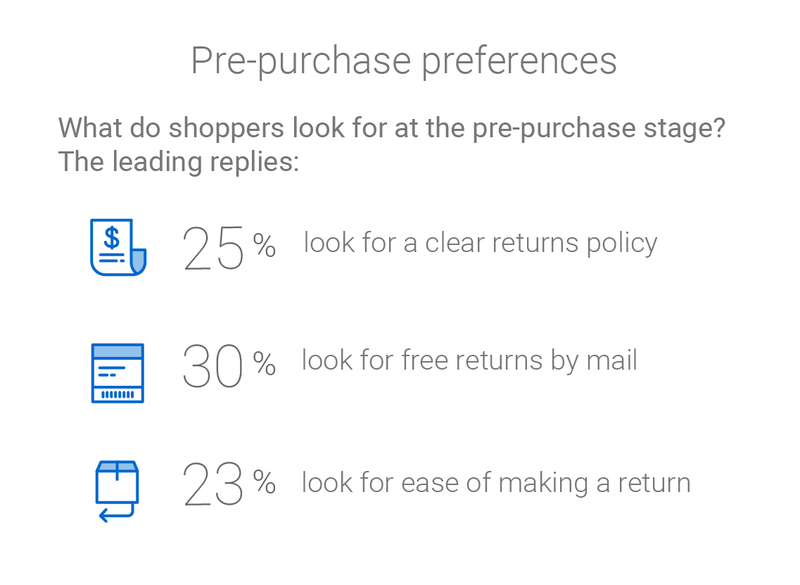 Far from an afterthought, returns have become a key driver of purchasing behaviour. E-commerce merchants who offer easy, affordable and convenient returns will attract new customers, convert browsers into buyers and secure loyal customers. 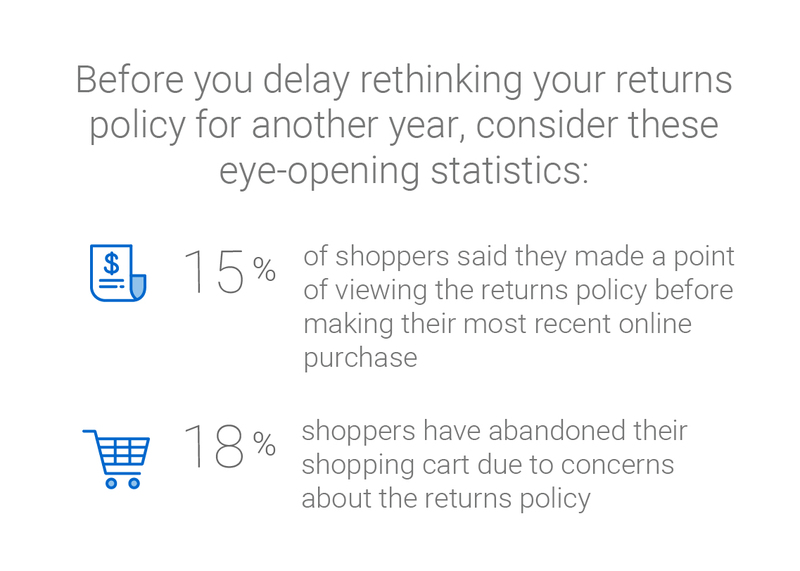 Many shoppers investigate the e-commerce business’ returns policy before they even place an item in their cart – well before they complete the checkout process. They assess the details of the business’ returns policy before they buy, and they may even compare one brand’s experience against another’s to help them choose which items they will buy online and from whom. It’s important to make your returns policy easy to understand and easy to find on your website. And it’s becoming increasingly important to make it as customer-friendly as possible. A complicated returns policy could cost you your next sale. Dive into Canadian e-commerce expectations, returns research, best practices, and market trends. The post-purchase returns experience, be it positive or negative, can have a massive effect on brand loyalty and can influence repeat business. Is a negative returns experience hurting your business? Consider how much time, money and effort it took to acquire each of your customers. Don’t risk souring those relationships with a bad returns experience. To shortchange the importance of that experience is to squander your earlier investment, as more than ¾ of Canadian shoppers would be unwilling to buy from the same merchant again after a negative returns experience. People love to share their positive and negative experiences in person and online. They also factor in the experiences of others into their buying behaviour. Offering a poor returns experience opens your business up to negative public reviews, bad word of mouth, bad publicity that could go viral and more. On the flip side, offering a stellar returns experience opens up your business to positive reviews, good word of mouth, repeat business and more. It’s important to assess what message your returns experience is sending and analyze how it can be improved. To create a good returns policy, you need to understand whose needs and expectations you are trying to meet. 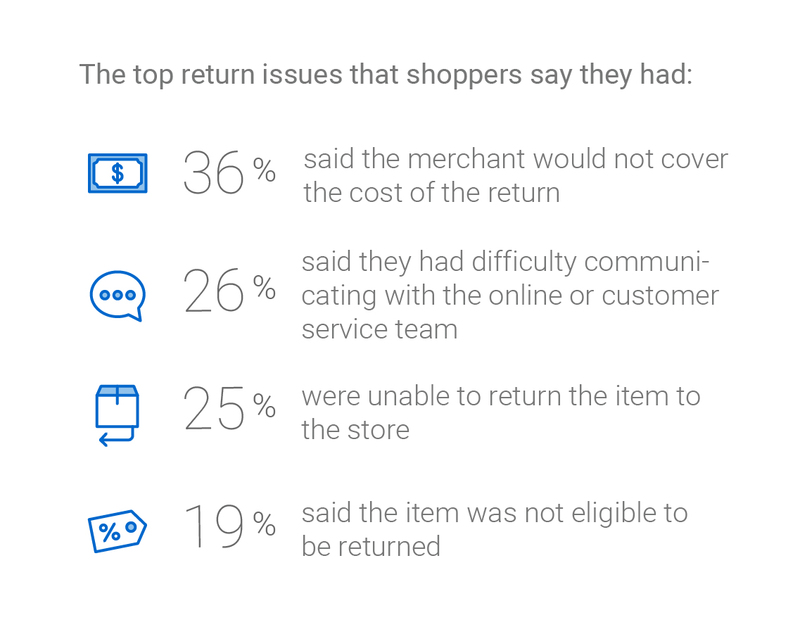 A good online returns experience offers a variety of options. Get to know these 6 common shoppers and address their concerns. A simple, easy-to-find returns policy creates confidence early in the shopping process. It’s so important to understand that a new-to-you shopper is seeing your product images, descriptions and sizing charts for the first time. For this type of shopper, returns are a safety net. ‘What if it doesn’t fit? What if it’s different than I expect?’ These and other such questions will be top of mind for this shopper. ‘Will it fit? Is it the right colour? Will the recipient love it? What if someone else buys the same gift for them?’ For these thoughtful gift-givers, returns are essential. Forcing an online shopper to one of your brick and mortar store locations to return their purchase isn’t something that works for everyone. What if there isn’t a location nearby? Consider a drop-off location that’s closer to your customer’s home or work, such as one of Canada Post’s 6,200 post offices. Forcing a customer to come in to return an item can also be a thorn in their side if they are returning a defective or damaged item. It’s important to make returns easy for your earnest customers, but not too easy for customers who may seek to exploit your business. Online shoppers who make 2 to 6 purchases a year represent 36% of Canada’s online shoppers – and 28% of them say they intend to make more online purchases in the coming year. Reassure them with multiple returns options that makes shopping with you stress free. Hyper shoppers (who make more than 25 purchases a year) and Hyper Elite shoppers (who make more than 41+ purchases a year) are the most active, experienced and confident. They’re familiar with the best-in-class returns experience and won’t settle for second best. Unfortunately, these are the customers whose dollars you want to win the most. Their loyalty can be invaluable to your business over time. They make offering a positive returns experience worthwhile. Footwear and apparel sizing is tricky because it varies from country to country, even brand to brand. Sizing confusion leads to more than 6 in 10 online shoppers to avoid purchasing apparel and footwear from merchants that don’t offer free returns by mail. More than 60% also don’t buy apparel and shoes from merchants that don’t accept free in-store returns and don’t have a nearby store. To win customers and avoid as many returns as possible, ensure that your products include clear and easy-to-follow sizing charts. Also consider offering free returns by mail to those who may misunderstand your sizing information or shop for others without clarity on their sizes. A customer-friendly returns policy may not seem cost effective. But it should be seen as a long-term investment. The more customers you satisfy, the brighter your financial future will be. And that’s the definition of good ROI, don’t you think?